It is very easy to be awed by Supercross: the sense of occasion, the setting (inside Major League Baseball and NFL stadiums), the ‘showy’ aspect and the sheer number of spectators (averaging around 50,000 per Saturday evening and for the seventeen rounds run in nineteen weeks across the USA). However, it is on the tracks themselves that the magic really happens. Up close it is hard to believe that riders can achieve that speed, h and distance and defy physics in manipulation of their 450cc motorcycles. Add intense racing – where twenty athletes are separated by mere inches both on the ground and through the air – and it seems like a violent dance of glorious madness. As reigning champions, Red Bull KTM Factory Racing are one of the principal ‘honey pots’ of the AMA paddock where the fans gather to eye the robust machinery as well as the refined individuals that need optimum physical and mental conditioning to attempt such a sport. We asked 28-year-old Broc Tickle, a former 250 SX West Champion and now into his first term on the KTM 450 SX-F alongside Marvin Musquin to tell us about the three principle – and obvious – requirements that Supercross demands: technique, fitness and bravery. A Supercross layout appears to leave very little room for error. The rolling jumps, landings, rhythm sections, banked ‘switchbacks’ and whoops all seem like a recipe for disaster if the slightest misjudgement occurs. How exactly does a rider execute a rapid lap considering that the motorcycle is in the air for almost half of the time? At an even simpler level: how do they know the power and distance needed to make a jump? Thanks to informative systems like LitPro, Supercross audiences can now see the speeds and personal data of racers like heartrate. 450 SX Main Events might only last 20 minutes and 1 lap but it is not surprising to learn that athletes are running at almost ‘maximum’ in that time. At Anaheim 2 and round three of the 2018 campaign 250 SX rider Christian Craig was chartered at a staggering 200bpm while racing. As Tickle reveals, being in shape to complete a race is one thing but extra reserves are needed to push extra boundaries. Supreme fitness and condition is also essential for matters like injury prevention for those close-call ‘moments’. Tickle makes an exaggerated positive gesture when we ask if the sport still makes him think twice or harbor occasional fear. Racers need to be able to have the personal tools to do the job and match those physical assets with the mental desire to engage in a sporting pursuit with a high level of risk. “There are certain scenarios where you watch a race and you think ‘they’re close!’ but when you are in the moment it doesn’t feel that way,” he assures. “Or if you have a ‘moment’ … it feels quite natural. 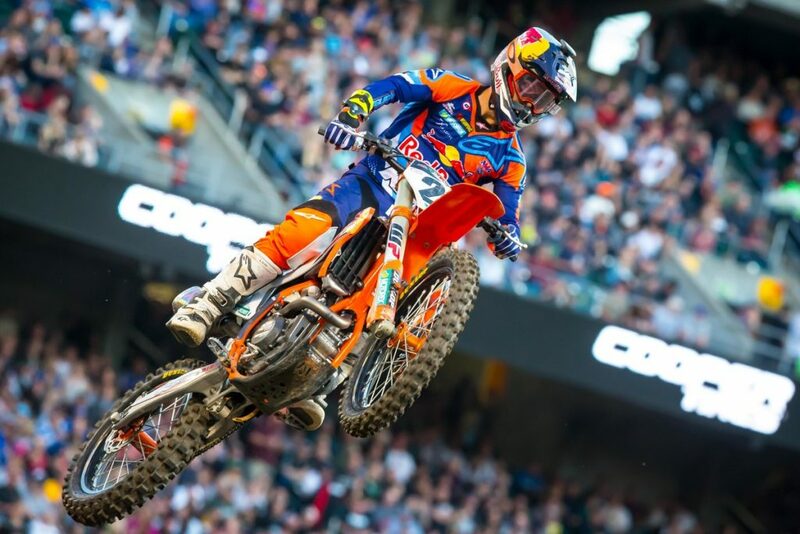 Everything is very tight in Supercross right now. Almost every rider in the Main Event has a factory bike or a well-supported team and it is all very close. I think the tracks have been mellowed because the bikes are so good now that we could pretty much jump anything. I think they [the promoters] are trying to achieve a balance of good racing and being able to keep everybody around [injury-free]. Personally, I have always built up as the season goes on. The margin for issues is so small. You have to be in tune with yourself and what is going on around you. Supercross carries grand spoils and a profile unmatched in motorcycle offroad racing (the last three multiple champions Ricky Carmichael, Ryan Villopoto and Ryan Dungey all retired in their mid-to-late twenties) however outside of the top elite, the risk-versus-reward aspect can be skewed. Those twenty hopefuls at the gate every Saturday night between January and May have made – and continue to make – big sacrifices to be under the stadium lights but it seems that most have a grounded realization of what the whole show is about.